Nathalie Djurberg and Hans Berg join New Museum Curator Gary Carrion-Murayari for a screening of select works from the artists’ back catalog followed by a discussion about their practice. 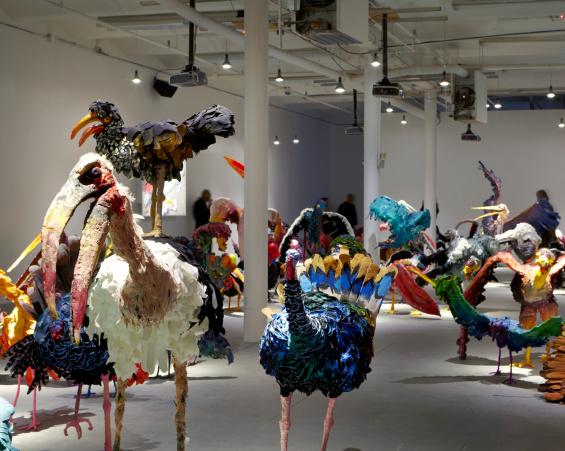 For her new work, The Parade (2011), Djurberg has created five captivating animations and an unnerving menagerie of more than eighty freestanding bird sculptures. Drawing on avian physiology, rituals of mating and territorial display, and the social phenomenon of flocking, she has assembled a fantastical procession of species all fashioned from modest materials such as clay, wire, and painted canvas. These hybrid, sometimes monstrous forms speak to the artist’s recurring interest in physical and psychological transformation, as well as pageantry, perversion, and abjection. In the accompanying claymation videos, humans and animals alike act out upsetting scenarios of torture, humiliation, and masquerade, further mining the interplay of brutality and guilt at the heart of Djurberg’s work. Berg’s eerie film scores—composed of elements both found and invented—suffuse the entire installation, merging to form a unified soundscape. With these films, both artists have begun to conceive narrative in spatial terms as aspects of character, setting, sound, and action migrate from one story to the next across the exhibition space. Born in Lysekil, Sweden, in 1978, Nathalie Djurberg received her MFA from Malmö Art Academy in 2002, and since that time she has exhibited widely in solo and group exhibitions around the world. Most notably, in 2009 she presented her installation The Experiment in the exhibition “Making Worlds” at the 53rd Venice Biennale, for which she was awarded the prestigious Silver Lion for Promising Young Artist. In 2008, Djurberg participated in the New Museum’s “After Nature” exhibition curated by Massimiliano Gioni. She currently lives and works in Berlin with Hans Berg. Hans Berg was born in Rättvik, Sweden, in 1978. He is a Berlin-based electronic music producer and self-taught musician. He began playing the drums in punk and rock bands at the age of fourteen. By fifteen, Berg started creating electronic music—which he has made ever since—when he purchased his first synthesizer and sampler. Berg and Djurberg met in Berlin in 2004. Since then, he has composed the music for all of her films and installations. “The Parade: Nathalie Djurberg with Music by Hans Berg” is curated by Eric Crosby and Dean Otto for the Walker Art Center and organized at the New Museum by Gary Carrion-Murayari, Curator. “The Parade: Nathalie Djurberg with Music by Hans Berg” is made possible by the generosity of the Leadership Council of the New Museum. Additional support is provided by Martin Margulies, Heather and Tony Podesta, and the Consulate General of Sweden in New York. Generous support for ‘Studio 231’ is provided by Ellyn and Saul Dennison, Mitzi and Warren Eisenberg, Susan and Leonard Feinstein, Hermine and David Heller, Lietta and Dakis Joannou, Toby Devan Lewis, and the Board of Trustees of the New Museum. Additional support for programming at ‘Studio 231’ is provided, in part, by the Laurie M. Tisch Illumination Fund. “The Parade: Nathalie Djurberg with Music by Hans Berg” is organized by the Walker Art Center, Minneapolis.